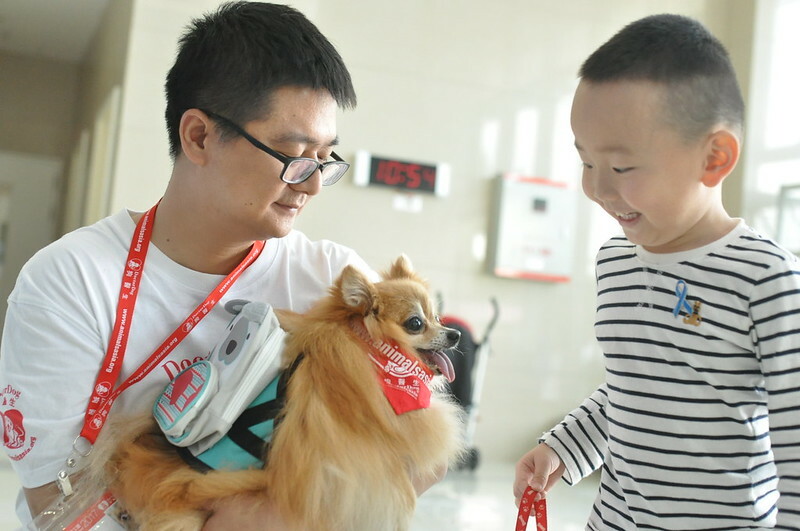 Hospital staff, patients and parents were won over by animal therapists during first-ever use of canines in a state-run hospital in the city of Shenzhen. In the lead up to World Autism Day, the Shenzhen Bao’an Women and Children Hospital in Guangdong province, China launched a new initiative to help the huge numbers of people living with learning disabilities. Six therapy animals from Animals Asia’s Dr Dog programme visited the facility to bring cheer to autistic children suffering from fear, stress, anxiety or loneliness, marking the first time a state-run facility in Shenzhen has allowed the use of canine therapy animals as part of Animals Asia’s Dr Dog programme..
More than 50 families attended the event with children learning how to pet dogs as well as how to comb their fur and take them for walks. Ma Liya, Director of the Child Healthcare Department at the Bao’an Women and Children Hospital said. “This was the first time we worked with Dr Dog and before the event, we did have some worries. We were afraid that the parents wouldn’t accept the dogs or that the children would be scared. But the moment I saw the therapy animals, all the worries melted away. Studies show therapy dogs are effective in facilitating the social behaviour of autistic children, cultivating a positive play environment and providing children with tactile stimulation. They can also help people with dementia since stroking a dog has been shown to reduce agitated behaviour, which is often associated with the condition. There are more than 10 million autistic people in China, over 2 million of which are children under 14 years old. In Guangdong province, there are about 260,000 autistic children. “Animals Asia’s Dr Dog programme has done so much work with people living with learning disabilities in private facilities, offering them companionship and empathy when life becomes challenging or lonely. 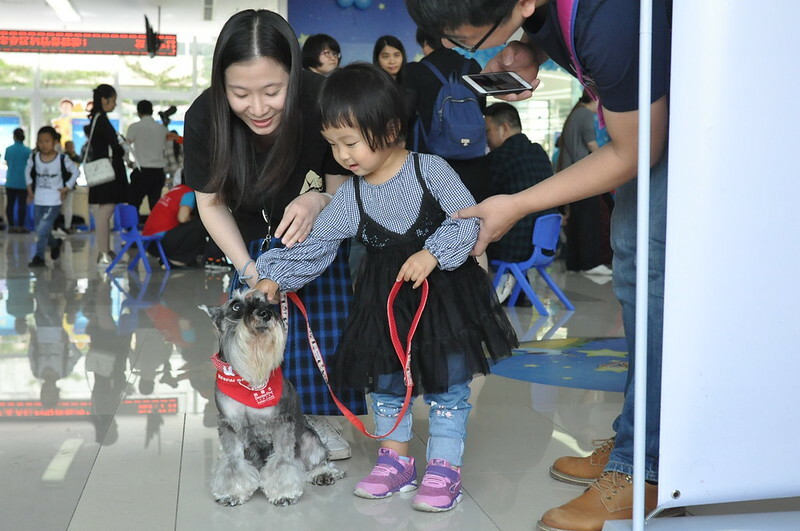 So it is hugely rewarding now to see the authorities in Guangdong province acknowledge the efficacy of animals benefitting autistic children and providing that service to their patients. 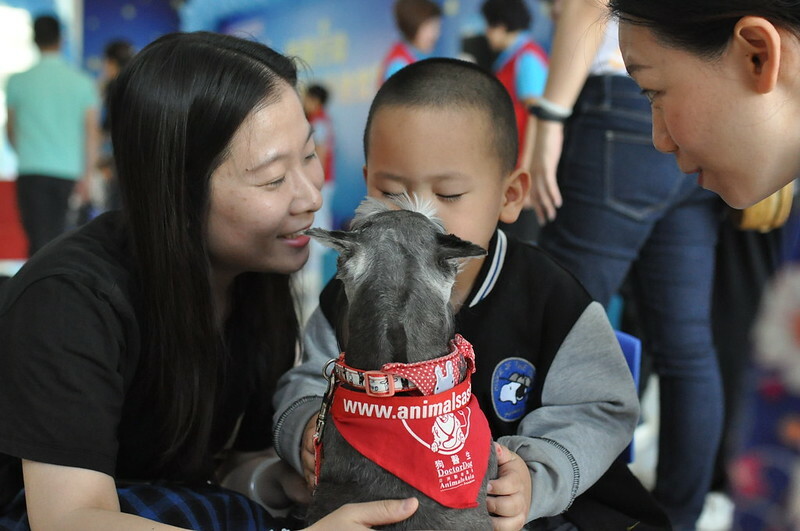 Since 1991, the Dr Dog programme has touched the lives of over 532,500 people at 5,890 events and activities in Hong Kong, Chengdu, Guangzhou and Shenzhen. Animals Asia’s Cat and Dog programme in China is carried out by Ya Dong Consulting, a consultancy wholly owned and advised by Animals Asia.